Share this article with a colleague. In the early 2000s, if you wanted to measure caspase activation in your cells you had several, imperfect options. You could measure PARP cleavage by Western blot, but that only gives you population information, not single-cell resolution. And of course, a Western blot is an endpoint assay. Some fluorescent caspase probes had been developed, such as FLICA (fluorochrome inhibitor of caspases), but they all had major issues such as poor permeability, poor dye retention, slow kinetics or toxicity. Enter NucView® real-time caspase-3 substrate. Biotium set out to invent a caspase substrate that could actually be used for real-time, long-term analysis. NucView® checked all of the boxes: highly cell-permeable probe, well-retained dye (by binding to DNA), and rapid kinetics, allowing for real-time imaging. Scientists at Biotium collaborated with researchers from the Firestone lab at UC Berkeley (Ref. 1) to show that NucView® can detect apoptosis much earlier than other substrates, with higher sensitivity and less toxicity. Apparently NucView® was just the tool that scientists had been waiting for, because there were already 7 publications using NucView® in the first year after it was released. That number continues to grow, with over 180 publications using NucView® to date. Around ¾ of users visualize NucView® in fluorescence microscopy, and ¼ use it in flow cytometric analysis. A growing number of scientists are using NucView® in real-time live cell imaging systems like the IncuCyte®. If you’re wondering whether NucView® will work in your cell type of interest, no need to worry: NucView® has been validated in at least 95 different cell lines, plus 49 types of primary cells. 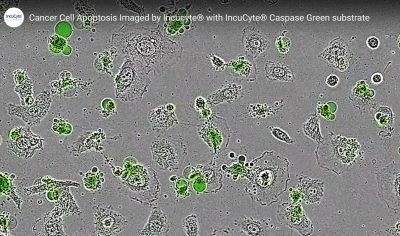 Basically, if a cell has caspases, NucView® can tell you if they’re active. People often ask us whether NucView® can be used in 3D cell culture or organoids. We now have 11 published examples of people using NucView® in 3D culture, organoids and tissue explants. See the list of validated cell lines below for more details. Click here for a full list of NucView® references, and here for a list of validated cell types. The original caspase-3 substrate that we made was NucView® 488, a fluorescent green probe. At Biotium, as experts in fluorescent dyes we know that the more colors the better for our customers! In 2014 we were excited to release a new, blue probe, NucView® 405. The blue NucView® is popular for use in flow cytometry, where it can be detected in the Pacific Blue® channel. In 2015 we released an orange version, NucView® 530. NucView® 530 is most often used in microscopy, detected in the Cy®3 channel. Biotium continues to pursue the development of new NucView® colors. Our next goal is to make a far-red version, so stay tuned for that! The real beauty of NucView® is that, being non-toxic, you can leave it in your cell culture and monitor progression through apoptosis over time. With the increased popularity of live cell imaging platforms and long-term cell tracking, NucView® has been catching a lot of attention, and has been licensed by many of our business partners for use on their live cell imaging systems. 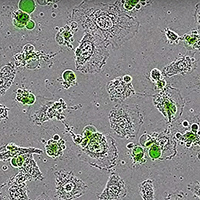 Below is an image taken on the IncuCyte® Live-Cell analysis system. To view the full time-lapse video, click here. It is exciting for us to look back at the past decade and see how our customers have found many uses for NucView®, and how it has contributed to fields such as cancer research. We look forward to reading more of the exciting research to come. Cen et al. FASEB J.2008 Apr;34(4):804-8, 810, 812-3.